This entry was posted on Friday, April 22nd, 2016 at 12:27 am and is filed under biology, climate, oceans. You can follow any responses to this entry through the RSS 2.0 feed. You can leave a response, or trackback from your own site. Also, what’s the natural rate of replenishment of live reefs? Another question is, what happens to all the life sheltered by the reef? How soon? Is there mitigation for that, even if not for the polyps themselves? That worries me a lot more than “the polyps”, since it’s an entire ecosystem. A third question: are there alternate polyp or zooxanthellae species that fare better? Can dead reefs be “reseeded” with those? Another question is, what happens to all the life sheltered by the reef? I don’t know. It’s an interesting question, because it’s not obvious to me how much better a living reef supports an ecosystem than a dead reef. First of all, people try to use abandoned oil rigs as substitutes for coral reefs—it’s called the rigs-to-reefs program. Apparently they’ve had some success. Second of all, I don’t know many animals that eat coral! The crown-of-thorns starfish is a famous example, but it’s generally considered a ‘pest’—by us humans, at least!—not a ‘good’ part of the reef ecosystem. When crown-of-thorn starfish became more common in the Great Barrier Reef, it was considered a disaster to be fought. Large populations of crown-of-thorns starfish (sometime emotively known as ‘plagues’) have been substantiated as occurring at twenty one locations of coral reefs during the 1960s to 1980s. These locations ranged from the Red Sea through the tropical Indo-Pacific region to French Polynesia. There were at least two substantiated repeated outbreaks at ten of these locations. The Great Barrier Reef is the most outstanding coral reef system in the world because of its great length, number of individual reefs and species diversity. When high densities of Acanthaster which were causing heavy mortality of coral were first seen about Green Island, off Cairns, in 1960–65, there was considerable alarm. High-density populations were subsequently found of a number of reefs to the south of Green Island, in the Central Great Barrier Reef region. Some popular publications suggested that the whole Reef was in danger of dying: ‘Requiem for the Reef’ and ‘Crown of Thorns: The Death of the Barrier Reef?’. They influenced and reflected some public alarm over the state and future of Great Barrier Reef. To prevent overpopulation of crown-of-thorns causing widespread destruction to coral reef habitats, humans have implemented a variety of control measures. Manual removals have been successful, but are relatively labour-intensive. Injecting sodium bisulphate into the starfish is the most efficient measure in practice. Sodium bisulphate is deadly to crown-of-thorns, but it does not harm the surrounding reef and oceanic ecosystems. To control areas of high infestations, teams of divers have had kill rates of up to 120 per hour per diver. The practice of dismembering them was shown to have a kill rate of 12 per hour per diver and the diver performing this test was spiked three times. Therefore, it is for this reason and not rumours that they might be able to regenerate that dismembering is not recommended. Etcetera… it’s actually pretty interesting! However, I bet there are some other ways in which living coral provides a better environment than dead, and eventually algae-covered, coral. Maybe I cannot grasp the full significance of the ongoing change in ecosystems. But for me, your view seems biased, too. Ok, the south pacific experienced a record El Nino, heating up the water. First of all, this is a natural phenomenon, which has been happening throughout history, including record years. Of course, humans probably have worsened its occurrence, but on the other hand, these things happen on scales where I see no real influence of humans. This is really misjudging our capabilities, even for the worse things we like to do all time! Second, what about the “winners” of this situation? It is dishonest to ignore them. For sure, some part of the ecosystem is benefitting, algae might show exponential growth due to these changes or whatever. But this is regarded by us, the humans, as detrimental, too. But why? Because we are conservative in thinking. Suppose we would still life in an ice age, imagine the protests about the decline in ice coverage. But we humans of today know, that our current state is much better, than an ice age. It is eco-romanticism to stare at the ruins of the past and admire them so much as to conserve them for eternity. It is a totally egocentric and biased view of the world. Yes, its egocentrism. The great barrier reef is only the surface, we say we do care about. In reality nothing cares to us except our own welfare. Its blatant nonsense. And indeed, that welfare may be endangered by our behaviour to our surroundings. I do not deny that. But please, one should get the records straight…the planet does not rely on us. Neither does the great barrier reef. Even it that would be gone forever, as it happens with other reefs we do not even know the name of in much earlier times, that does not matter to the global ecosystem as much as our panics about it. And it does not change the situation of one person stops flying to conferences. That is only an excuse for feeling better personally. It maybe would change the situation if ALL people stop to fly. And this will never happen and we know it. We will never reach any climate goal. There is no indication for it in the past, and there will be no one in the future. If anything happens, than that we will aggressively exploit all our ressources and then, from one day to another, go back to rock age. This is far more realistical. Sorry for this pessimism. This is really misjudging our capabilities, even for the worse things we like to do all time! If you’re saying that various natural processes go beyond what humans can do, yes. If you’re saying that we can’t affect the Earth’s climate in ways which are detrimental for life as we know it, then no, that’s definitely in our power. Yes, an asteroid or an ice age can shake up the ecosystem more than we can. Nature can be more destructive than us. But nature is just the name we give to everything that isn’t us, so that’s not saying much. I’d like to set a higher bar than “not the worst thing in existence”. It is dishonest to ignore them. For sure, some part of the ecosystem is benefitting, algae might show exponential growth due to these changes or whatever. But this is regarded by us, the humans, as detrimental, too. But why? Because we are conservative in thinking. Diversity in ecosystems is a standard measure of their health. We’re not talking about a single creature that was hunted by another, but an entire sector of the environment that’s largely perished in a few decades. A giant algae bloom would be a pretty bad scenario, like saying a virus that kills all animal life is “also a winner” so we should be indifferent about the outcome. Yes, ecological diversity is important not because of some baked-in law of reality but only because people think it’s important. I don’t see why that’s incompatible with saying we should protect it or that it’s sad when we fail to. And it does not change the situation of one person stops flying to conferences. That is only an excuse for feeling better personally. It maybe would change the situation if ALL people stop to fly. And this will never happen and we know it. You could use this as an argument demonstrating that society never undergoes any kind of structural change, which is clearly untrue. Society is made up of individuals. There is nothing more to the collective decision to stop than a bunch of individual decisions to stop. Saying that the individual changes don’t matter doesn’t really seem consistent, because there’s nothing beyond them. Using that as a reason to do nothing in the face of something you consider important is falling for the most basic game-theoretic trap there is. You are right, in many ways we can change our environment to our disadvantage. But the specific case mentioned is a phenomenon like El Nino. I do not see how anyone should be able to affect such a truly global phenomenon, even not by some rise in global temperature levels. Maybe if one starts a nuclear war, but not with our economy. You are right, too, by the diversity argument. But, as you say by yourself, this is not a law of nature. We like to think that diverse systems are better, for many reasons. In this respect an exponential algae growth would be bad. But I guess it is more complicated in the real case of the great barrier reef. Who tells us, that there has to be a great barrier reef in the location we find it? What would be the overall result if this reef would perish and maybe at some other location another reef would start to blossom? This is only a simplified argument, the thing I would like to highlight is that we always only judge these things having the status quo in mind, and we almost always judge change as bad. But this clearly is a human bias. I think you are wrong concerning the third argument. It is true that society is made of individuals, but not all individuals have the same power to influence their surroundings. The “weights” of individual actions are really different. And many actions are not really meaningful, e.g. reducing your CO2 footprint by paying some money to someone is like paying money to go directly to heaven, a practice common in catholic countries in the late medieval times. And it does not change the situation of one person stops flying to conferences. Right. I wasn’t suggesting that if I stop flying to conferences the Great Barrier Reef will miraculously revive. That is only an excuse for feeling better personally. If some small good deed makes us feel better, we should do it. We should not delude ourselves into thinking our action has a big effect. But luckily, it’s possible to still feel better without succumbing to this delusion. In fact, this is the basis of morality. Most of what we do will not solve the huge problems of the world. Nonetheless, we choose to do what helps a bit rather than hurts a bit. The situation with my personal air travel and the Great Barrier Reef is exactly parallel. There is a lot more to say about this. The relation between individual small actions and large-scale problems is quite subtle and interesting. But I’ll say just one thing. There’s a “multiplier effect” that takes place when many people change their behavior and publicly let others know they’ve done so. It maybe would change the situation if ALL people stop to fly. And this will never happen and we know it. I don’t think airplane flights will cease, but I think people will radically cut their carbon emissions during this century, and for people “like me” (successful academics and businessmen, who already don’t drive much and live in energy-efficient dwellings) one really easy way to dramatically cut ones carbon emissions purely by personal action is to take fewer airplane trips. I believe the practice of such people flying to lots of conferences will decrease as the technology for “telepresence” improves and becomes more popular. I want to encourage that. That’s why I give lots of talks using Skype, and I gave a lecture at Google in the form of a robot. The technology is still awkward, but even now the problems are counterbalanced by how nice it is to stay home and give a talk in one hour rather than spend a day travelling somewhere and a day travelling back. I agree that it is different from a moral point of view. Yes, it is true, for moral reasons we behave in certain ways even if we know that we are doing something with a vanishing net effect. But this is, in my point of view, also a problem. What is the right morale? Especially concerning a problem which is truly complex. We know that even full-time philosophers can think up moralic dilemmas which hardly anyone could “solve” unambigiously. In my point of view, what many people call their “morale” is nothing less than ideology. And you are right, you can induce change in many people by letting others know your moral actions. But the same mechanism works for ideology. However, with one important difference. If your actions are founded in your personal morale, you will not “force” others to follow your point of view. If your actions are founded in ideology that outcome is almost inevitable. In the end, it will be not a question of freely skipping the travel to a conference, but someone will not allow you to do so. What began as individual actions, freely and with the best intentions, will end in laws enforced by some power. But I agree, I would also like to see technology evolve in such a way, that you can participate in conferences without being really at the place. Some virtual reality thing. I think this could happen within the next decade. But will it reduce the travel? I think there is a empirical “law” that saving a ressource by some technical means tends to increase its spending, e.g. producing leds does not save electrical power because people invent new ways of using this technology and in the end you need more electrical power than ever before. 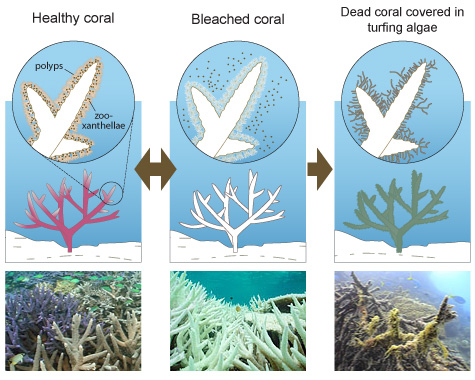 If the corals are superficial, then the water is more warm, so that they are exposed to the air; so that the zooxanthellae expulsion can be a feedback to block the growth of the corals out of the water against the lower corals (and the same can be valid for other not optimal condition for the zooxanthellae). If it is so, then this is a genetic elementary method to optimize the corals population growth, and it is not simple to change this genetic response; perhaps a little genetic modification of the corals could be possible (if the genes responsible are known), or a higher zooxanthellae concentration could modify the response (with an automatic cultivation and diffusion in the atolls), or a zooxanthellae genetically modified for extreme environment could interact with the corals to avoid the expulsion (it could exist a chemical message from zooxanthellae to corals to demand the expulsion when there are not optimal conditions). The safe way to reduce the problem is to solve the climate change. But the specific case mentioned is a phenomenon like El Nino. I do not see how anyone should be able to affect such a truly global phenomenon, even not by some rise in global temperature levels. Well, your argument keeps shifting. Now you’re saying that human-caused global warming can’t possibly have affected the peak temperature of Pacific waters during the El Niño. This is just wrong. There’s a lot of evidence that this is exactly what happened this year. • Chris Mooney, Scientists say there’s basically no way the Great Barrier Reef was bleached naturally, Washington Post, 29 April 2016. 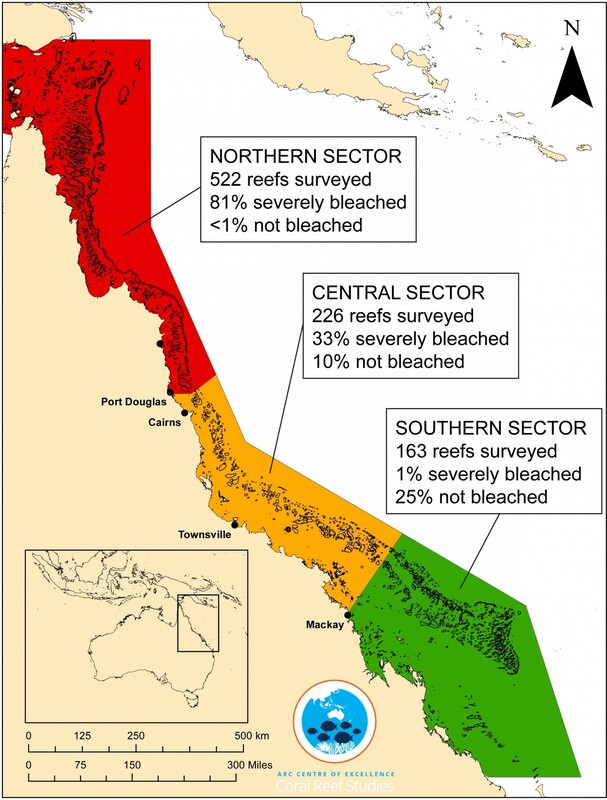 This year, we’ve seen alarming bleaching of the Great Barrier Reef, caused by warm sea temperatures. A recently completed aerial survey of the reef found that 93 percent of the smaller reefs that comprise it showed at least some bleaching, and in the northern sector of the reef, the large majority of reefs saw bleaching that was severe — meaning many of these corals could die. “Human caused climate change made the extreme ocean temperatures that led to the massive bleaching events along the Great Barrier Reef this year at least 175 times more likely,” finds the analysis, which was led by Andrew King, a researcher studying climate extremes at the University of Melbourne. King and his four colleagues freely confess that their analysis has not yet been peer-reviewed — science doesn’t move that fast — and admit to adopting the “unusual approach of releasing the results before publication.” But they defend the move in light of the situation. “Because we have confidence in the methods, the methods have been peer reviewed, and because the results are so strong, we decided we needed to release them almost immediately. It’s important for the public to know that climate change is making these bleaching events far more likely,” said King in an interview. Indeed, when it comes to the overall methods, we have reported previously on peer reviewed research conducted by King and a colleague, demonstrating how climate change greatly upped the odds of record breaking Australian temperatures in recent years. The new research follows a similar methodology, King said. The researchers have also posted their data and methods online. King added in an interview that the researchers were sure to include a coral reef expert, Ove Hoegh-Guldberg, who directs the Global Change Institute at the University of Queensland, in the analysis. The situation itself is rather extraordinary in a scientific sense — we know the extent of the bleaching event itself due to an aerial survey that scientists released online, also in near real time. At the heart of the new analysis is the warm March sea temperatures of the Coral Sea region, which the researchers say set a new record for that month, at more than 1 degree Celsius above the long-term average. 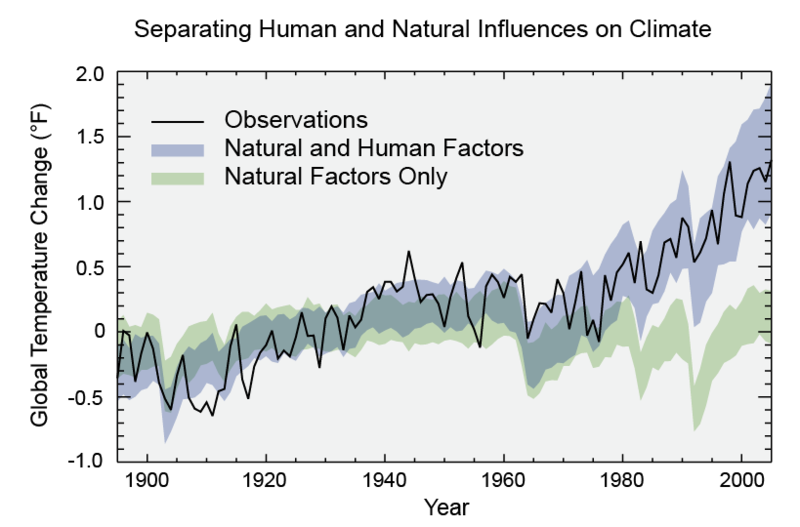 The scientists then proceeded to conduct what is called an “attribution” study, which involves running large numbers of climate model iterations, with and without the human global warming influence included, to determine how likely such a warm departure is to occur in each set of model runs. The result was that the warm Coral Sea extremes were far more likely in the runs that included human-induced climate change than in those that did not. This is where the statement that the event is 175 times more likely to occur due to climate change comes from. The researchers also noted that they did not detect much of a role of the recent strong El Nino event in March 2016’s warm Coral Sea temperatures. Rather, they say human-caused global warming is what set the stage. Granted, in other parts of the world, that may not be the case, notes Kim Cobb, a coral reef expert whose research has focused on Christmas Island in the central Pacific, which saw massive coral death this year. The new Great Barrier Reef analysis also looks forward in time — and the analysis, unfortunately, gets even worse. The study also found that while March was scorchingly hot in the Coral Sea and well out of the ordinary, these kinds of temperatures will become, more and more, the norm. Warm temperatures like those of March would tend to occur every other year by 2034, the analysis found. “The future of coral dominated reef systems like the Great Barrier Reef is now in serious doubt,” says a press statement about the work. So what do other researchers think of conducting a real-time attribution study like this one? The Post gathered a number of responses from researchers familiar with the kinds of scientific questions involved. Heidi Cullen, the chief scientist at Climate Central and a researcher who has favored this approach, strongly supported the analysis in a statement. Adam Sobel, a climate researcher at the Lamont-Doherty Earth Observatory at Columbia University, expressed a similar view. David Titley of Penn State University, who led a recent National Academies report on extreme event attribution — which said that we can now say, with at least some events, that climate change made them more likely to occur — was somewhat more circumspect, however. 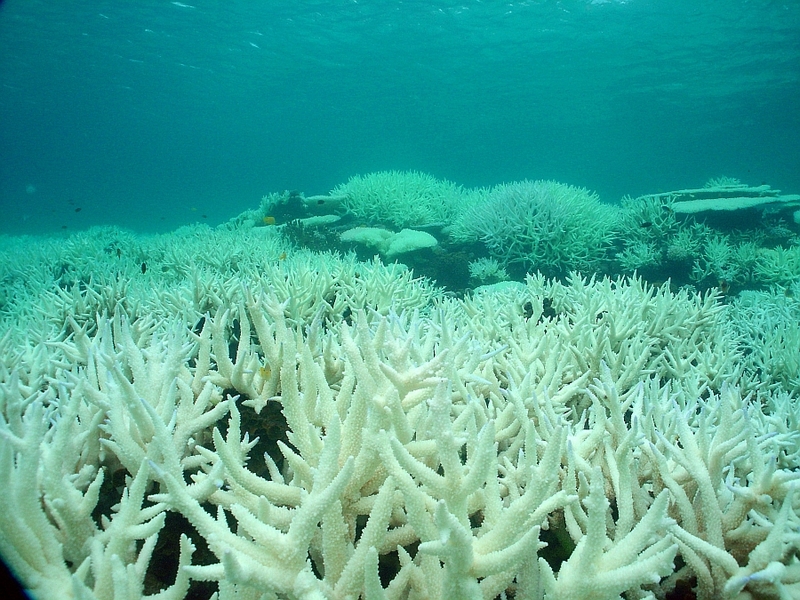 “Regardless of peer review, the massive bleaching of the corals is tragically consistent with an ever-warming planet,” he said. However, when it comes to attributing extreme events to climate change, Titley noted that scientists are most confident when it comes to air temperature anomalies, like heat waves. The current event is, in some ways, an oceanic analogue to that, but “it’s not clear to me how much has been previously published on attributing specific extreme ocean heat events,” Titley said. “Unless there’s a body of literature for ocean warming events similar to land-based heat events, it seems that going through peer-review would be the appropriate path forward for a scientific paper,” he added. We also contacted Noah Diffenbaugh of Stanford University, who has published on attribution research and is familiar with the methods used by King and his colleagues. Indeed, Diffenbaugh said he is working on a similar analysis of the anomalously warm temperatures afflicting the Great Barrier Reef, though it is not ready for publication yet. He added, though, that as more analyses like this happen in real time, there are many reasons that researchers may come up with different results, based on slightly different methods or, simply, the problem of scientific uncertainty — and that scientists may need to better coordinate their real-time attribution work. “Different peer reviewed methods analyzing the same event will come up with different values,” Diffenbaugh cautioned. Well, first of all, thanks for the detailed material concerning this phenomenon. What should I reply? I am not convinced. Maybe I do not have to be. I would like to let time decide, who is right or wrong, but surely this attitude could be detrimental to us all, I understand this. It annoys me, as an aside, that most of the paragraph is about whether the study has undergone peer-review or not. Why do the people not wait until it is properly reviewed? It may take some weeks to months. If we do not have this small time to wait, until everything is settled and published in the usual way, including the comments and remarks of the reviewers and the revision by the authors, then what is the meaning about this research at all? If it is not for pushing something beyond the simpe truth of their results? Either they are scientifically valid, than neither peer-review nor non-peer-review will change anything or they are not valid, than also peer-review makes no difference. It is alarmism and certainly does not help for a proper discussion, because any critic will jump exactly at this formal points of research and does not discuss the real important content (I may be such a critic, in your eyes, or maybe only some advocatus diaboli who does not like to get distracted by such type of unnecessary discussion about the solidity of this kind of research only because the authors could not wait to get it peer-reviewed…because we will never hear the opinion of the referees, for example). It annoys me also, that someone is always searching for the “smoking gun”. This is not science. Its marketing. Its hype. Its unnecessary. If it is the truth, there is no need for “smoking guns” to make it more truthful. Stop making advertisement of an urgent problem, exactly because it is too important to neglect. But ok, this is not about the data, but the presentation of it. The data indeed shows some effect, if one believes the methods. I cannot judge them. I have to admit this. Could be right or wrong. I have to believe the scientific community at this point. The graph is very clear, but except for a few experts no one can be sure that it is true, too. Unfortunenately, I would agree. However, it is said that “Our understanding of the physical mechanism — the connection between higher ocean temperature and coral bleaching — is solid.” which I do believe, too. Because this effect is comparatively simple, you probably can study it separately from everything else, probably even under lab surroundings. But this does not resolve any debate about where the higher ocean temperatures come from, what is their cause, and if really human influence has something to do with it (or is indeed the main cause). And this is where it gets really, really, really complex. The whole business of climate research and the whole business of heated discussions about it centres around this topic. To say, one has understood a comparatively simple mechanism and implicitely understand it as giving a justification for all the rest is probably only possible if you do not have any more doubts about anthropogenic influence or if you do not like to discuss the more difficult issues disconnected from the simple phenomenon. Certainly, from a logical point of view, it is not an convincing argument in its own. Yes, we do know (from experiment) that corals bleach at higher ocean temperatures, yes, we do know (from experience) that El Nino is causing this, yes, we may still doubt that human influence rises the seawater temperatures. For me, there is some evidence for this. too, but there is no evidence that real time attribution does work at all. It is a claim by the authors. A selfish one, because if it would work, they do have their interest in being the first one to show it. Proof it. By the way, if everything would be really that simple, and our understanding already that deep, has anyone predicted this coral bleach before it happened? Like, “the coming El Nino will be record breaking in rising water temperatures and therefore the Great Barrier Reef will bleach”. Has anyone? And if not, why not?